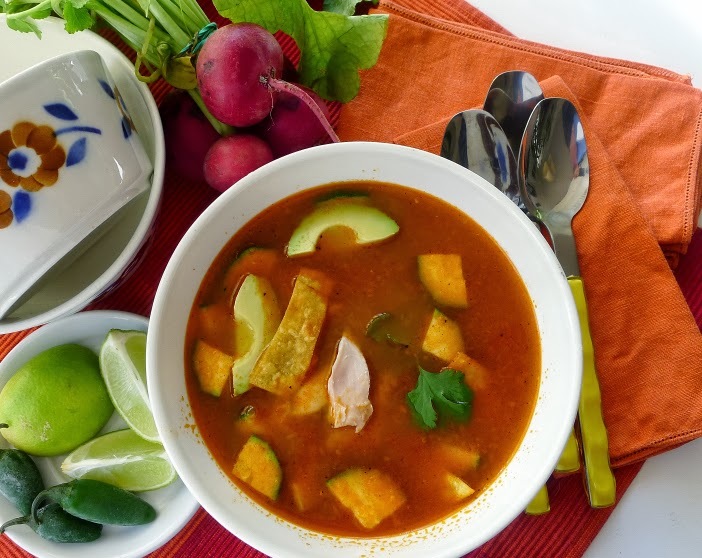 Soups from round the world: Mexican tortilla soup. On my calendar, February is Soup Month. When the weather is too chill for my daily salad lunch, what I want is soup. Spain is big soup country, so I have a lot to choose from. 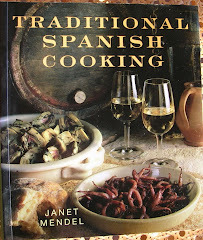 While this blog is dedicated to Spanish cooking, Spanish is not the only food from my kitchen. So, this month, I’m taking my soup pot right around the world. 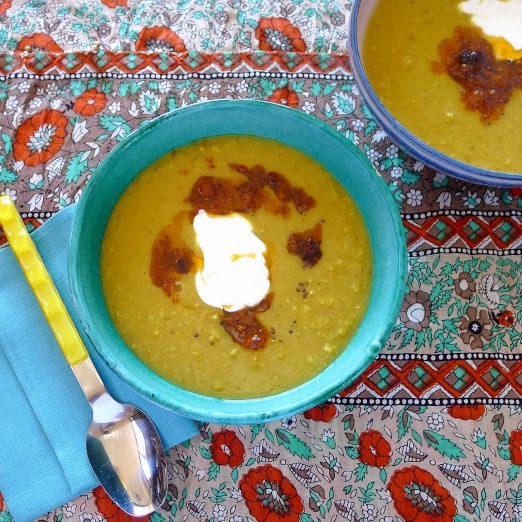 It started with a Facebook link to Saveur for a recipe for Mulligatawny, a spicy soup from India, by cookbook author Madhur Jaffrey (see the recipe here). The soup with red lentils, spices and coconut milk is topped with a sauce of more spices fried in butter. Except, I replaced the butter in the recipe with olive oil. Not authentic! you say. Well, no. But, authenticity was never my criteria for a good soup, whatever it’s origin. I´m after big flavor, plenty of vegetables, and stick-to-the-ribs satisfaction. In my humble opinion, olive oil is an improvement on butter! Red lentils are flavored with ginger, garlic, onion, chilies, coriander, cumin and turmeric and finished with coconut milk. The red sauce on top is made with olive oil, Aleppo pepper, cumin, coriander and black mustard seeds. Made with vegetable stock, this is a hearty vegetarian soup. 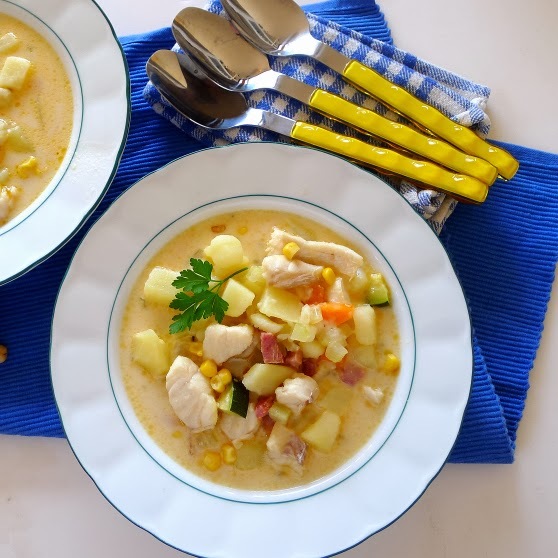 For this chowder, saute onions, celery and carrots in olive oil, add potatoes, zucchini and corn kernels and simmer in (homemade) chicken broth. Enrich the soup with evaporated milk. Add chunks of white fish and cook them until flaky. 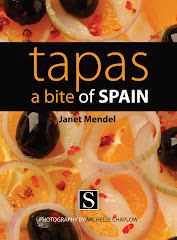 Serve with crisped bits of bacon or serrano ham. 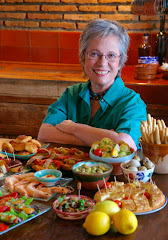 This recipe by Faye Levy, author of Feast from the Mideast, recently appeared in the Jerusalem Post (about Faye here ). I like that the meatball mixture includes chickpea flour. Poaching the meatballs in soup makes it unnecessary to fry them. The only tweaking to Faye’s recipe was to add some olive oil to the soup and to make the meatballs with ground chicken thighs instead of beef. 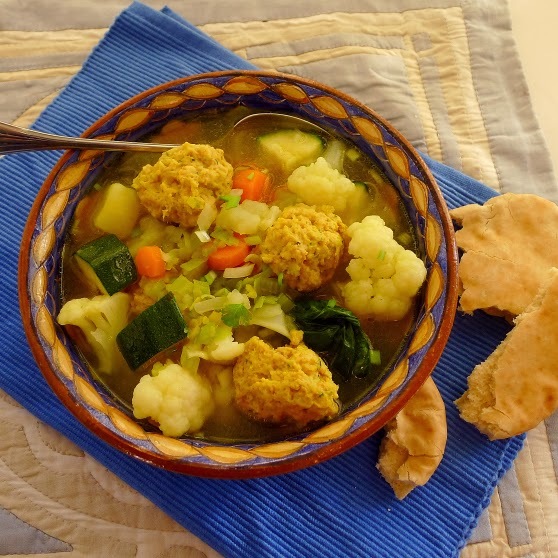 Middle Eastern Meatball and Vegetable Soup, by Faye Levy (used with permission). Bring 7 cups water to a boil with a pinch of salt in a stew pan. Add potato chunks and cook, covered, for 15 minutes. Add cauliflower and sliced carrots, return to a boil, and cook for 3 minutes. Add squash slices, return to a boil, and cook for 3 minutes or until vegetables are just tender. Remove vegetables with a slotted spoon. Add onion, diced carrots, celery, ginger root, garlic and parsley stems to vegetable cooking liquid. Bring to a boil. Cover and simmer over low heat for 30 minutes. Add cumin, turmeric and pepper. Discard parsley stems. To make meatballs: In a medium bowl combine the beef, chickpea flour, grated onion, parsley, salt, pepper and turmeric. Knead until thoroughly mixed. Shape mixture in meatballs, using about 1 tablespoon of mixture for each one. Add them one by one to the simmering soup. If there is not enough broth to cover the meatballs, add ½ to 1 cup hot water, pouring it near the side of the pan, not over the meatballs. Cover and cook the meatballs over low heat for 45 minutes, or until soup is well-flavored. If soup is too thin, uncover for the last 15 minutes of cooking; if it is too thick, gradually add ¼ to ½ cup hot water. Just before serving, add spinach to soup and heat for 1 minute or until wilted. Return cooked vegetables to soup and heat through. Taste and adjust seasoning. Serve soup sprinkled with chopped green onion. 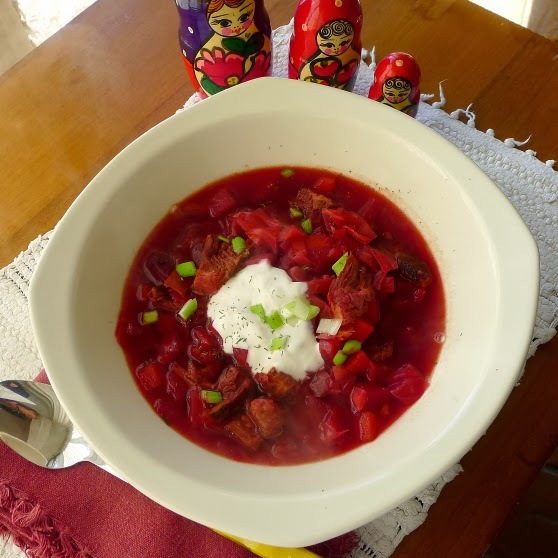 Tender chunks of beef go into the soup with beets, carrots, turnips, onions and cabbage cooked in beef broth. I used olive oil instead of butter and substituted Greek yogurt for the sour cream garnish. 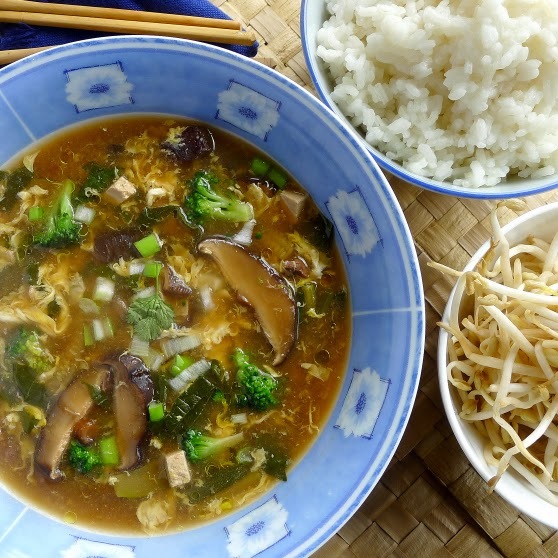 Strips of pork, cubes of tofu and beaten eggs go into a peppery soup with mushrooms. Here, it’s served with white rice and bean sprouts on the side. This is one of my favorite winter soups, when avocados are in season. 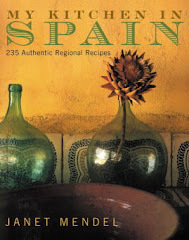 My tortilla soup is based on a recipe I clipped from Gourmet magazine (December 1990). Way back then, I couldn’t get corn tortillas in Spain (in Spain, tortilla is a potato-egg cake), so I brought fresh ones back from the US and stored them in my freezer. Then as now, I ad lib to the recipe to suit my mood. I almost always add a vegetable—zucchini or cut-up green beans, for instance. And, of course, I use olive oil instead of lard or other vegetable oil. Here’s my basic recipe. In a soup pot combine the broth and water. Bring to a boil, add the chicken thighs, cover and simmer until the chicken is tender, about 30 minutes. Skim the chicken out of the broth and let it cool. In a food processor combine the onion, chilies, garlic and tomatoes. Heat 2 tablespoons oil in a small skillet and add the onion mixture. Fry on high heat until mixture is reduced and beginning to stick to the pan, about 12 minutes. Add ½ cup of broth to the skillet and stir. Add the skillet mixture to the soup pot with the zucchini and simmer the soup 15 minutes. Shred or chop the chicken and return it to the soup. Cut the tortillas in half and into crosswise strips. Heat the oil in a small skillet and fry the strips, a few at a time, until crisp and golden. Drain on paper towels. 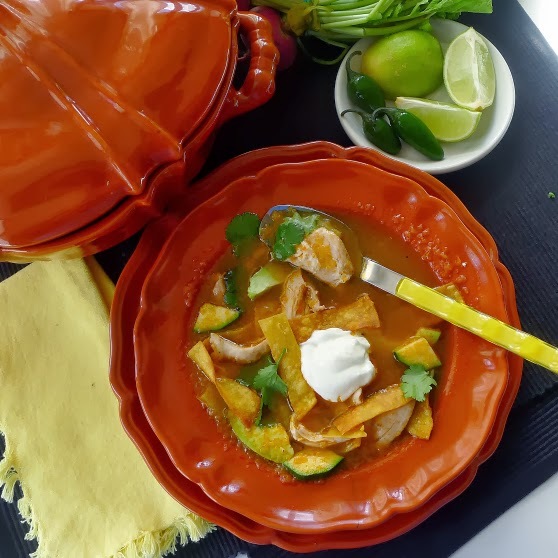 Serve the soup garnished with fried tortilla strips, sliced avocado, a dollop of yogurt and cilantro. Serve limes, radishes, onions and chilies on the side. 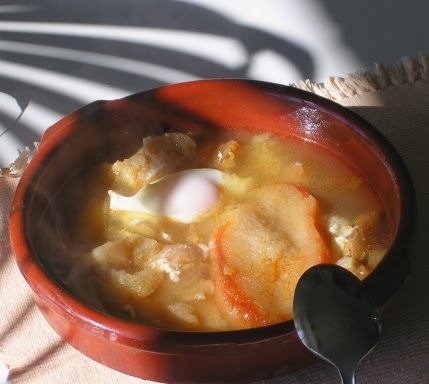 Here are links to just a few of the Spanish soups that have previously appeared in this blog. Crispy cheese-filled rolls, perfect with a glass of wine. I was surprised to find, In my small village grocery store, a package containing hojas de brick, leaves of a ready-made pastry known as brik or brick or bric. 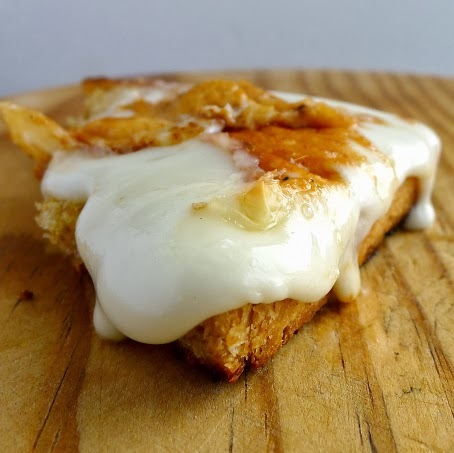 Brik is not part of traditional Spanish cooking, but I had watched Spanish chefs use it in cooking demos to create all sorts of fancy pastries with both sweet and savory fillings. I could not resist buying the packet. A little fun in the kitchen, experimenting with a new ingredient. Brik is a very, very thin pastry, also known as malsouqa in Tunisia, where it comes from. 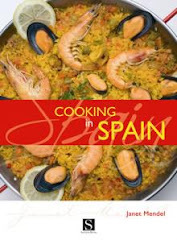 Over the years, it has become naturalized in France and, from there, has made it’s way into Spanish cooking. It is somewhat like phyllo or Turkish yufka, but considerably easier to work with, as it is not so apt to dry out and become brittle. It’s most like Moroccan warqa. 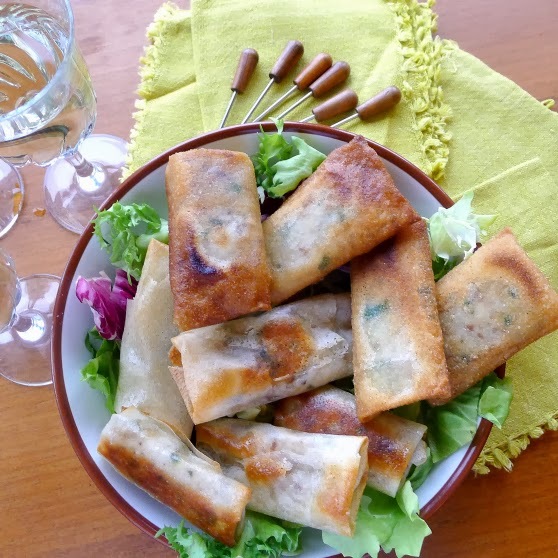 I put out a query about brik on Facebook’s Moroccan Cooking page and Paula Wolfert, author of THE FOOD OF MOROCCO (ECCO, 2012), replied: “Brik pastry is a wee bit thicker than Moroccan warqa. The making of warqa, the paper-thin pastry leaves used in the famous Moroccan briks, pastillas, and other recipes, is always performed by specialists. It’s wonderful to watch these women as they knead a ball of dough then tap it multiple times on a metal pan heated over a charcoal brazier, creating a paper-thin leaf, dab by dab. It’s a time consuming process, difficult to master” (although Paula suggests an easier method). Brik--as thin as tissue paper. But, back to my kitchen in Spain, where I have ready-made brik. I opened the package of brik and found 10 circular sheets of pastry, about 12 inches in diameter, each separated by a sheet of waxed paper. 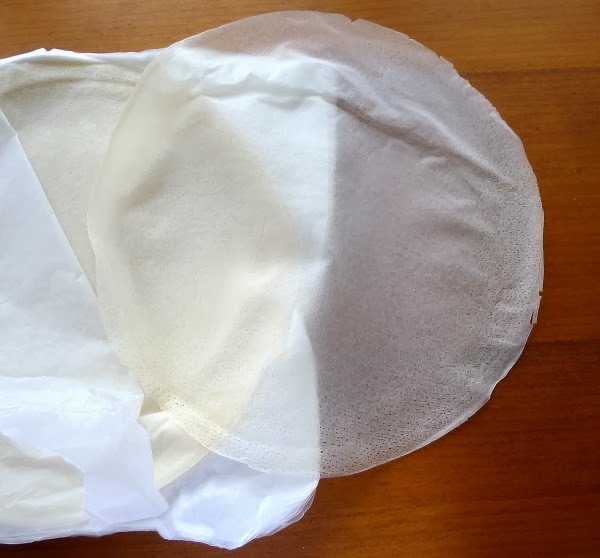 Paper thin, they look somewhat like crêpes, with slightly lacy-looking edges. The label says they are made with wheat flour, water, salt, sunflower oil, preservatives, acidulant and emulsifying agent. I removed five sheets and returned the rest to the plastic package, taping it closed and storing in the fridge. The remaining sheets kept very well until I used them a few days later. Brik pastry can be fried or baked. 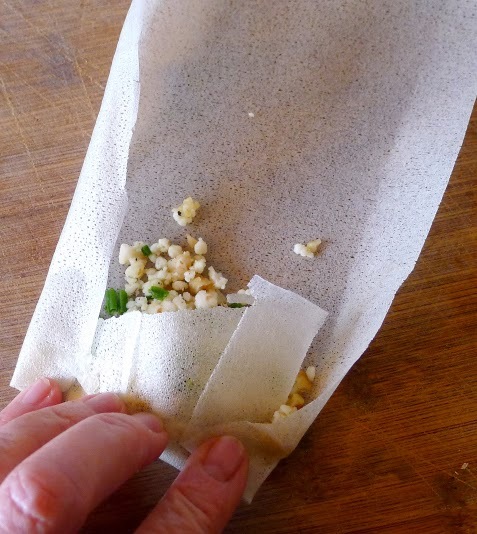 The classic Tunisian brik, with a whole (raw) egg sealed inside a triangular packet, is fried. I tried both frying and baking and actually prefer the baked ones. They come out of the oven shatteringly crisp. Cones of brik pastry also can be baked without a filling. Brik pastry is best served soon after baking, before it loses its snap. But, a day later, I experimented with reheating some of them (90 seconds in a 400ºF-oven). They crisped up quite nicely. 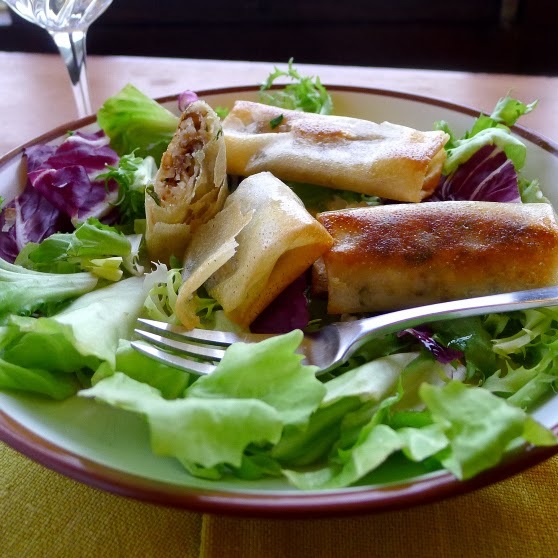 Cut in half, roll reveals filling of cheese and walnuts. Crispy Cheese Rolls were the most successful of my experiments. They were easy to assemble. I used toothpicks to secure the rolls, but I don’t think this is necessary. The picks are hard to remove after frying or baking without breaking the pastry. Half of the rolls I fried in olive oil, the remainder I baked. I discovered it was best to place them on the baking sheet with the seam-side up, so that the smooth side browned on the bottom. Some I brushed with oil, some I didn’t. The ones brushed with oil browned a little better, but it’s hardly necessary. I used cured goat cheese to fill these rolls. Cured Manchego could be used instead. Directions are given for both frying and baking the rolls. They are best served immediately, while still hot. A sweet-tart quince sauce would be a good accompaniment (recipe ). Serve any sauce separately so it doesn't turn the pastry soggy. In a bowl combine the nuts, cheese, chives and pepper. Cut pastry sheet in half, add filling. 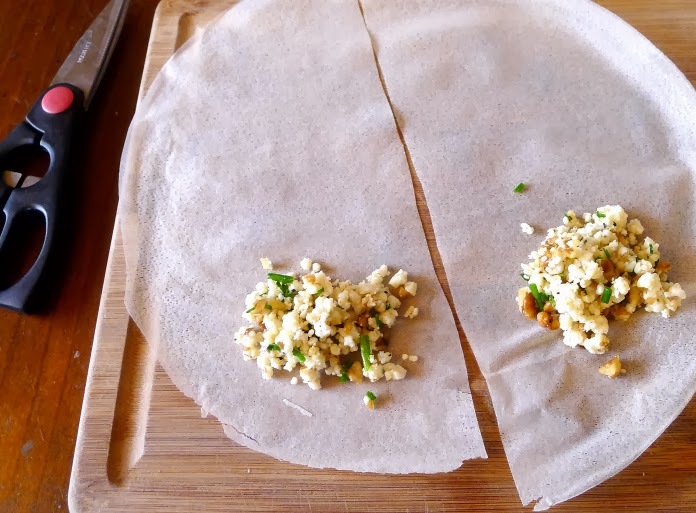 Use kitchen scissors to cut one sheet of the brik pastry in half. Place a spoonful of the nut-cheese mixture at the end of one half. Fold in the sides, then roll up the strip of pastry to form a roll. Place on a baking sheet. Repeat, using half a sheet of pastry for each roll. To bake the rolls, preheat oven to 400ºF. If desired, brush the rolls with oil. Bake the rolls until lightly browned, about 5 minutes. To fry the rolls, heat ½ inch of oil in a skillet. Fry the rolls, a few at a time, turning them to brown both sides, about 30 seconds per side. Remove and allow to drain on paper towels. 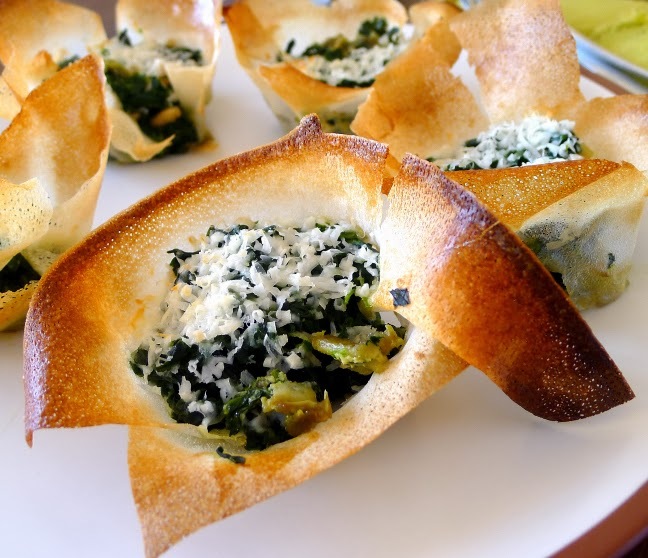 Crispy pastry cups are filled with spinach, cheese. Heat the oil in a skillet and fry the pine nuts until golden. Skim them out and reserve. Add the garlic. When it begins to brown, add the spinach. Season with salt, pepper, nutmeg and vinegar. Cook until spinach is wilted and all the moisture is cooked off. Remove to a small bowl. Stir in the pine nuts and egg yolk. Brush a 6-muffin tin with olive oil. Cut 1 brik pastry leaf in quarters. Fit one quarter into a muffin cup. Place a second quarter-leaf into the cup. Use remaining pastry, cut in quarters, to line 5 more muffin cups. Divide the spinach filling between the 6 cups. Sprinkle grated cheese on tops. Bake until the edges of the pastry are golden-brown, about 4 minutes. Carefully remove the pastry cups from the muffin tin. Serve hot. 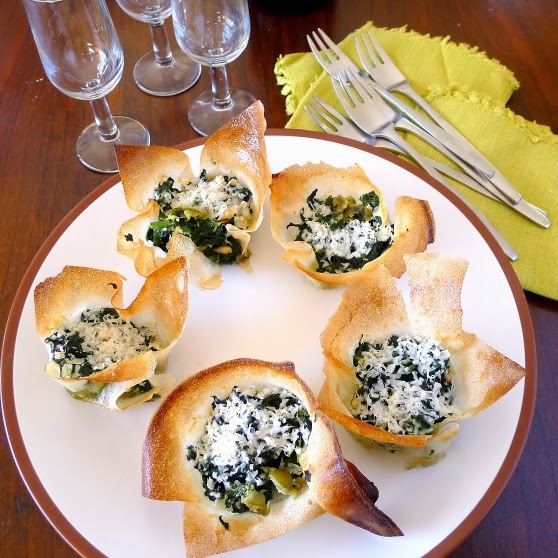 Aperitif or starter, spinach-filled pastry cups are so good. When I was a kid, meatloaf was a favorite family dinner. Baked in the oven with potatoes and carrots alongside, my mom’s meatloaf was nothing fancy—no garlic, maybe a pinch of thyme—but it was juicy and satisfying. An economical meal of ground beef to feed four kids, meatloaf was definitely not something you served to company! I’ve come a long way since then (I was a kid in the 1950s, in the Midwest)! I recently served meatloaf at a dinner party and it was a great success. 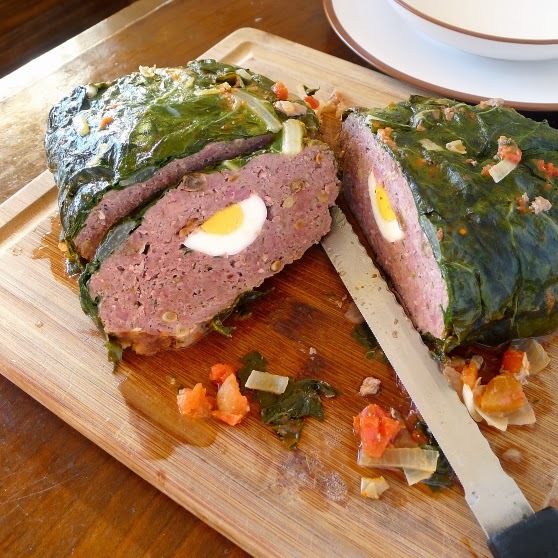 It wasn’t exactly “mom’s meatloaf.” Or, a Castillian mom’s version—spiced ground lamb braised in a wrap of chard leaves with a surprise in the middle—nuggets of hard-boiled egg. Pine nuts and raisins complement the lamb and make it a very special meat loaf. Ready for oven-braising--ground lamb wrapped in chard leaves. Here, I’ve simplified the recipe by eliminating the frying step and oven-braising the meatloaf. The meatloaf can also be made with a mixture of lamb and ground beef or chicken. And, instead of the “sweet” spices—cinnamon, cloves, and nutmeg—it can be flavored with thyme and rosemary. A layer of roasted red peppers can be spread in the center, either instead of or in addition to the egg. 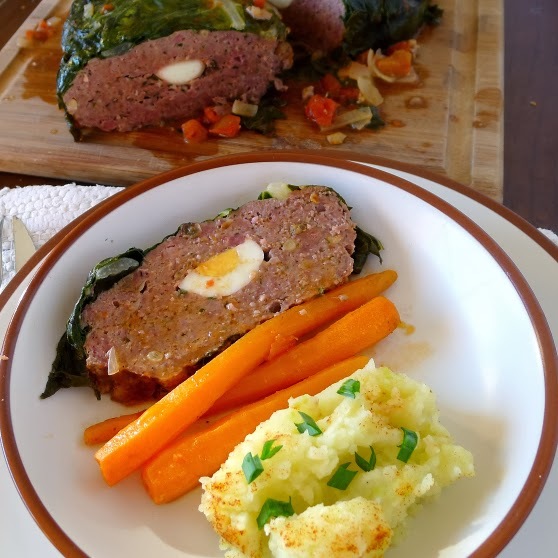 I cooked whole carrots with the meatloaf to serve as a side, along with Potatoes Mashed with Green Garlic (that recipe is here ). Sliced meat roll shows nuggets of egg. Heat 1 teaspoon of the olive oil in a small skillet and fry the pine nuts until they are golden. Remove and reserve them. Cut off chard stems and discard (or save for another use). Bring a large pot of water to a boil and blanch the leaves just until wilted, about 30 seconds. Drain the leaves. Soak the breadcrumbs in water to cover until softened. Squeeze out the water and put the softened bread in a mixing bowl. Add the ground lamb, garlic, parsley, bacon, minced onion, raisins, toasted pine nuts, cloves, cinnamon, nutmeg, coriander, ½ teaspoon salt, pepper and beaten eggs. With a large wooden spoon (or hands) mix the meat thoroughly with the other ingredients. Spread half the meat on a layer of leaves. Spread a dampened kitchen towel on a work surface. Lay half of the chard leaves, shiny-side down, in an overlapping layer on the cloth. Divide the meat in half. Pat one-half of the meat into an oblong (about 9 inches). Place the cooked eggs, cut-side down, in a row down the middle. Pat the remaining meat on top of the eggs. 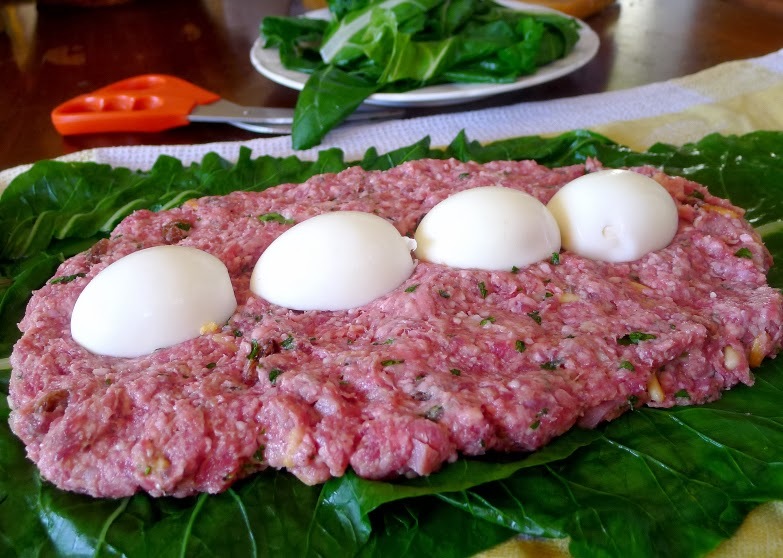 With the hands, shape the meat into a loaf, sealing in the eggs. Fold the chard leaves up over the meat roll. 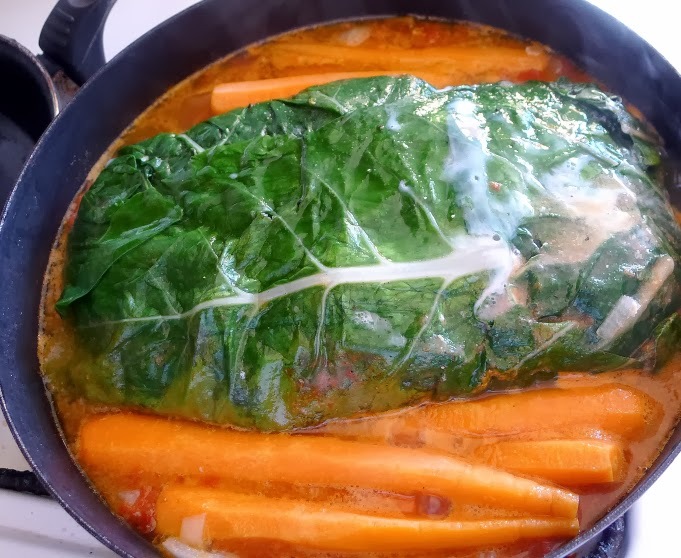 Cover with remaining chard leaves and tuck them under the roll, completely enclosing the meat roll. Pat the roll to firm it. It is not necessary to tie the roll. If cooking the meat loaf in the oven, preheat to 350ºF. Heat the remaining oil in a deep skillet or casserole big enough to hold the roll. Put in the roll, the coarsely chopped onions and carrots. Add the tomatoes, water, sugar and wine. Bring the liquid to a simmer, cover the casserole and either simmer on top of the stove or place in the oven. If braising the meatloaf on top of the stove, after 35 minutes, carefully turn it over (not necessary if the meat is oven-braised). 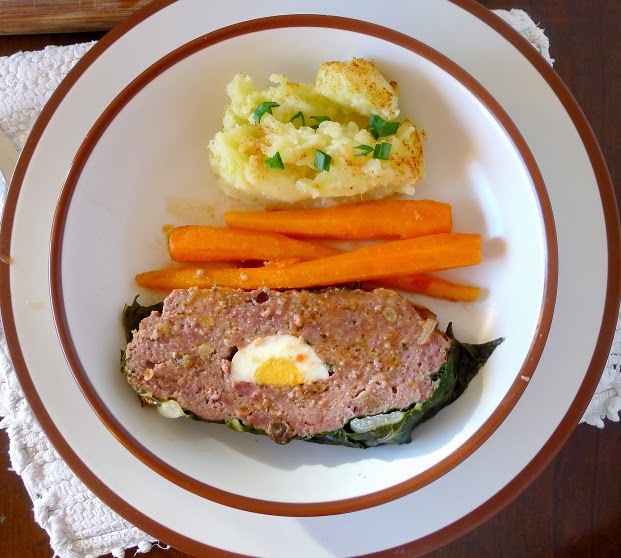 Cook the meatloaf, in total, 70 minutes, whether on top of the stove or in the oven. Remove the meatloaf to a cutting board and allow to set for 10 minutes. Use a serrated knife to slice it. Place whole carrots, if using, in a serving bowl and keep warm. Place all of the liquid and vegetables remaining in the casserole in a blender with the flour. Blend until smooth. Return to the pan and simmer until gravy is thickened. Use pan juices to make gravy. It’s Goat Day in Málaga! Closing a two-month celebration of the Cabra Malagueña, the Málaga breed of goat, are events for school kids (chance to feed a baby goat with a bottle), a sculpture show and gastronomy tastings. Málaga-breed goat (photo by Assoc. de Criadores de la Cabra Malagueña). 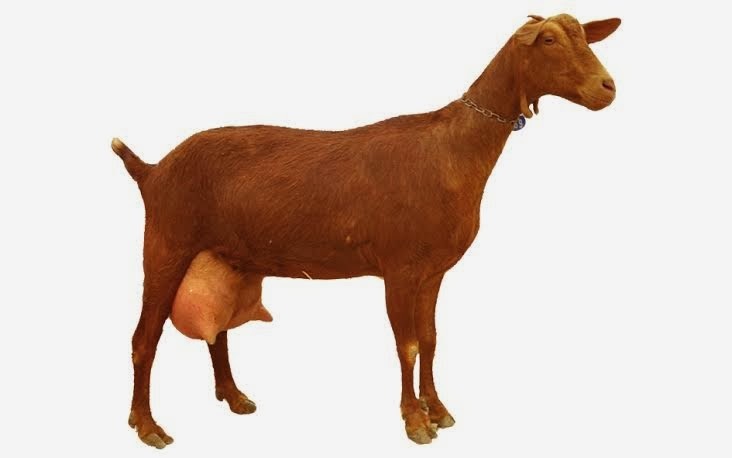 The breed, Cabra Malagueña (http://www.cabrama.com/index ), is a short-haired, cinnamon-colored goat, autochthonous to Málaga province. It is noted for being especially fertile and a good milk producer, adaptable to arid terrain where it makes good use of natural pasturage. 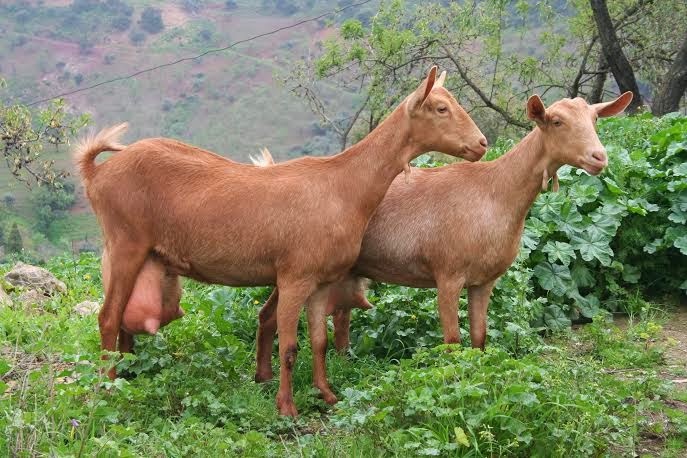 There are around 200,000 Málaga-breed goats in the province, producing 70 million liters of milk per year. 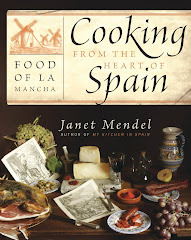 About 90 percent of the milk goes to big industrial cheese makers in La Mancha, Barcelona and France. Call lost and found--abandoned goat. I got my own goat. Getting rid of her was the hard part. It happened on Christmas Day, when the goatherd brought his herd across the hillside—as he has done many, many times before. Maybe he had had too much holiday brandy, because he lost control of his flock, which destroyed my vegetable garden. He finally drove them off my property and headed back over the hill. But he left one goat behind. Oddly, she had no bell. She moseyed about, cropping grass, shrubs and weeds. At night, when it rained a bit, she bumped at the front door, begging to be let in. I did not let her in! Yes, there were jokes about goat stew. And, “milking it for all it’s worth”. (I wondered if she needed milking—apparently not, but I wouldn’t have known). She had an ID tag on her ear—but there was no one to call during a holiday week. It was nine days before we finally located the owner, who came to retrieve her. The goat was fine. Years ago, there were several herds of goats in the village. They went out every morning to graze. As they passed through the streets, housewives would come out with their pails and the goatherd would milk the goats at their doorstep. The warm milk was carried to the kitchen and brought three times to a boil in a special milk-boiler. It was then ready to be poured into coffee, whisked into thick drinking chocolate, or cooked in a sweet pudding. During the milking season, the goatherds made cheese with the excess milk, which I used to buy at a neighborhood shop. It was a small round of very white curds, marked by the woven esparto grass molds in which it was pressed. The cheese was soft and fresh, very mild in flavor, lightly salted. I never suffered any ill effects from eating raw-milk cheese, but I knew people who did. Nowadays it is prohibited by health regulations to sell fresh cheese made from unpasteurized milk. So, along with a culinary colleague who was visiting (Lars Kronmark, who is a chef-instructor of culinary arts at the Culinary Institute of America (CIA http://www.ciachef.edu/california/) Greystone in Napa Valley, California), I went to see how goat’s milk cheese is made at an artisanal cheesemaker, El Pastor del Valle, http://www.elpastordelvalle.com/entrada.html in the nearby town of Alhaurín el Grande (Málaga). 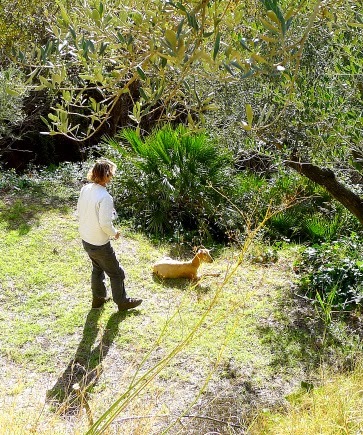 Antonio Vera de la Rosa tends 750 Málaga-breed goats and his wife, Josefa (Pepi) Burgos Carabantes, makes cheese. 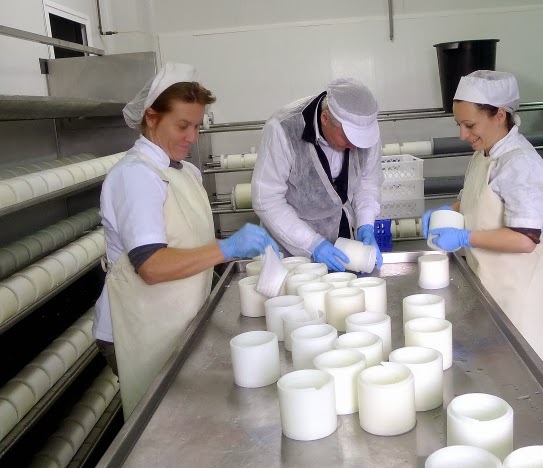 The dairy produces fresh cheese, semi-cured, cured, viejo (aged), raw-milk cured cheese, goat’s milk yogurt, requesón (ricotta) and processed cheese spread. The milk comes by truck from the farm, where the goats are milked twice a day. 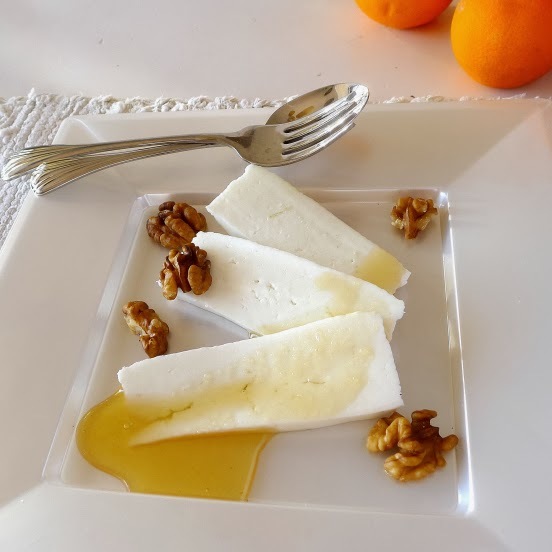 The fresh cheese (queso fresco) starts with pasteurization of the milk. That destroys both good and bad bacteria and also changes the calcium balance of the milk. The curdling agent—rennet, a substance taken from baby goats—along with calcium chloride, which restores the calcium balance and firms up the curds, are added to the warm milk, which is allowed to set until it begins to curdle, or form curds. The curds are cut with a lira, or lyre, a mechanical arm with steel threads that cuts the curds into bits about the size of lentils. The whey is allowed to drain off. The whey is collected—some is heated to make requesón—the same as ricotta, which just means “re-cooked”—the rest goes to feed pigs or, Pepi tells us, as fertilizer in avocado groves! Pepi and her helper pack the curds into cheese-cloth-lined two-part plastic molds. The molds show a crosshatch pattern that mimics the woven esparto grass strips that were used in traditional cheese making. The molds are mounted on a horizontal press and squeezed to release further liquid. Pepi, left, is the master cheese maker. Lars, center, learns how Spanish goat cheese is made. Removed from the molds, fresh cheeses are ready for brining. Splash! Cheeses go into the salmuera, a 15-percent salt solution, where they stay for 2 hours. Once drained, the fresh cheese is ready to eat. It keeps, refrigerated, for about 20 days. Fresh goat’s cheese is my favorite snack food—toasted bread, olive oil, slices of cheese and raw onion. It also works as a dessert—serve it with a dribble of honey and some walnuts. 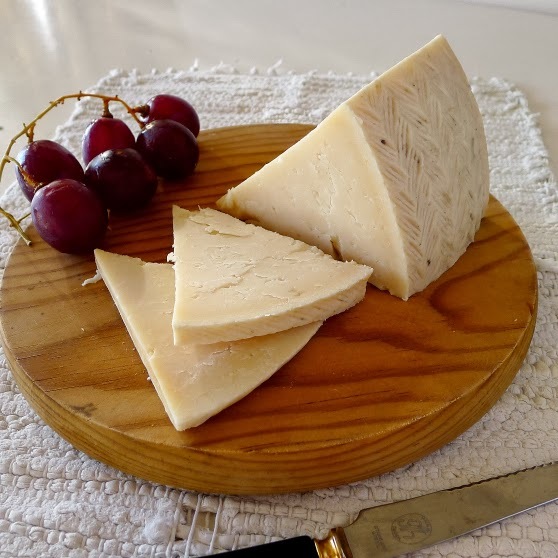 Semi-cured and cured cheese made from pasteurized milk start out much the same, but they require the addition of lactic fermentation agents, which are destroyed by pasteurization, that convert milk sugar into lactic acid, producing the characteristic cheese flavor. Semi-cured cheese needs a minimum of 20 days of aging; cured, more than 2 months, and viejo, aged, more than 6 months. The rinds are rubbed with olive oil. Some are dusted with rosemary or pimentón (paprika), which add flavor. Pepi says she makes raw milk cheese maybe only once a month, because it requires a very stringent hygienic protocol. Raw-milk cheese requires nothing further than rennet, as the milk’s natural bacteria provide the lactic ferments that give it character. It does require aging a minimum of two months, after which it is safe to eat. 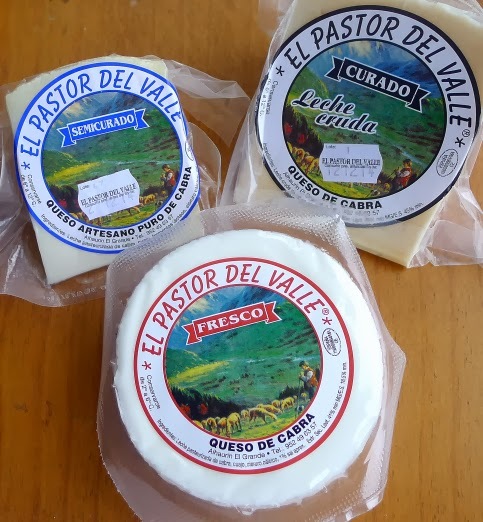 The raw milk cheese from El Pastor del Valle is rubbed with Ibérico pork fat, adding another layer of umami flavor to the cheese, which is slightly splintery, slightly piquant. Today’s cheese making produces about 300 half-kilo (1-pound) cheeses from about 750 liters (quarts) of milk. Expand? No, says Pepi. “We don’t want to be big industry. We want to make only what we can store and sell.” El Pastor del Valle distributes to shops in Málaga province and, by order, to restaurants. Raw milk cured goat's milk cheese. Uvas y queso saben de beso. Grapes and cheese taste like a kiss. A little breathy, very sweet. I love raw milk cured goat's cheese with amontillado Sherry or with a verdejo white wine. Tannins in red wine seem to get in the way of the flavors of aged goat’s cheese. 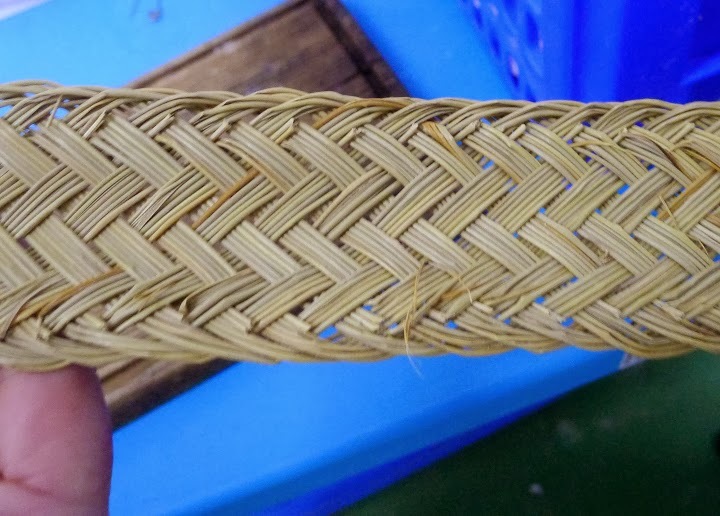 Woven strips of esparto once used to mold the fresh cheese. Málaga-breed dairy goats (photo from Associacion de Criadores).